Just after Chelsea’s Ross Barkley scored the equalizer in the 96th minute of their match against Manchester United on Saturday, Chelsea assistant coach Marco Ianni ran onto the field in front of United manager José Mourinho, heaved an almighty fist pump, and then jogged back to his bench. As Ianni headed back to his side, Mourinho lunged at him, then tried to follow him into the tunnel, looking very much like a person who wanted to fight, or at least get in Ianni’s face. Mourinho was held back by stewards. 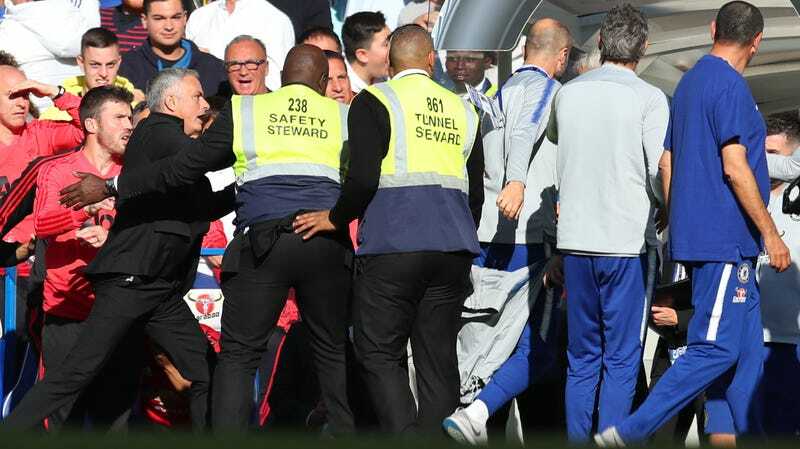 In the two days that followed, coverage of the incident, which could only generously be described as a “scuffle,” sided almost fully with Mourinho. The Mirror’s headline read: Chelsea coach Marco Ianni should be SACKED after Jose Mourinho altercation, says Phil Neville; ESPN FC’s said: Manchester United boss Jose Mourinho on Chelsea coach clash: I told him to forget it; Express wrote: Jose Mourinho: Man Utd boss was RIGHT to fume at Chelsea coach - Alan Shearer; and the Telegraph headline said: Chelsea furious with assistant coach for celebrating wildly in front of Jose Mourinho. A day later, the headlines evolved to highlight Mourinho’s magnanimity. From Sky Sports: Manchester United boss Jose Mourinho defends Marco Ianni after clash; the Telegraph’s headline read: Jose Mourinho pleads with Chelsea not to sack Marco Ianni after Stamford Bridge touchline row; and the Independent wrote: Manchester United manager Jose Mourinho calls for Chelsea to show leniency to Marco Ianni.